As noted by Dr. Smith, who was the first head of Stanford University’s Department of Horticulture, the California poppy’s historical connections are as fascinating as its flower is beautiful. These brilliant orange flowers were certainly noticed by California’s early explorers, but it wasn’t until 1792 that naturalists arrived in California to begin collecting specimens for European herbaria. In that year, Captain George Vancouver’s H.M.S. Discovery sailed along the coast of California during its four-year exploratory voyage. The ship’s surgeon and naturalist was a Scotsman, Archibald Menzies, who collected specimens of the poppy and upon his return to England, gave them to various botanists for their collections. The formal description and naming of the California poppy was not published until 1820. The botanist was Adelbert von Chamisso, and he named the plant Eschscholzia californica for his friend and fellow naturalist Johann Friedrich Gustav von Eschscholtz. Chamisso and Eschscholtz had been aboard the Rurik, a Russian ship under the command of Captain Otto von Kotzebue that set out in 1815 to explore the Pacific islands and the coastline of North America, and ultimately, to search for the elusive Northwest Passage. 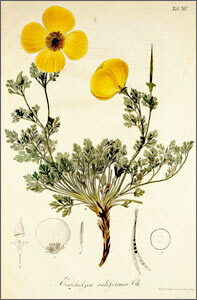 In 1816 the two naturalists spent a month near San Francisco collecting specimens, including the poppy. Once back in St. Petersburg, Kotzebue, Chamisso, and Eschscholtz published a three-volume account of their explorations, but descriptions of their botanical collections were published separately in various journals. While there had been an artist aboard the Rurik, he was tasked with recording only landscapes and natives -- not plants. The first illustration of Eschscholzia californica did not appear for several years after the collection of the specimen. In 1820 Friedrich Guimpel prepared a hand-colored engraving to accompany Chamisso’s description of the plant in the journal Horae physicae Berolinenses . The illustration is of the actual pressed plant with little attempt made to recreate the form or color of the flower as it would have appeared nature. To get this radiant wildflower into the gardens of Europe, another exploring botanist was required. In 1830, several years after the Rurik’s travels along California’s coast, the Scottish botanist David Douglas landed in Monterey to collect seeds for the Royal Horticultural Society of London. He spent two years there before traveling on to Hawaii, where in 1834 he died after a fall (or as suspected by some, a push) into a bullock pit that was also occupied by a wild bull. His legacy to European gardeners was the introduction of a multitude of California’s wonderful wildflowers, which for many years were more popular and revered in Europe than in their native land. Besides being commemorated by Chamisso in the genus of California’s poppies, Eschscholtz was further honored by Captain Kotzebue by his naming of Eschscholtz Bay in Alaska’s Kotzebue Sound during their explorations there. Eschscholtz joined the Captain again in 1823 for a circumnavigation on the Predpriaeti. During its four-year voyage, Eschscholtz amassed large natural collections and acquired a passion for entomology. Kotzebue again honored his ship’s surgeon by naming a group of Pacific islands Escholtz Atoll (renamed Bikini Atoll in 1946). It is interesting that this vibrant flower with so many devotees would be first presented to the scientific community with such a lackluster portrait. But soon artists for the many botanical and gardening publications of the time began to give the poppy its proper due, painting in vivid colors the poppies that were being growing in Europe’s gardens. Note: from German to Russian back to German to Latin…a word about the various spellings above. This appeared in the February 2015 issue of The Desert Breeze, the monthly newsletter of the Tucson Cactus and Succulent Society.